The Swedish rapper is back, this time with a quicker flow in tow. 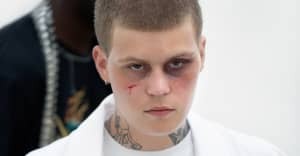 While Yung Lean typically keeps it laid back in his cadence and flow, the Swedish rapper kicks it up a notch on his latest surprise release "Crash Bandicoot." The track, produced by Foster and Holy Beats, sees Lean jump from rapping about drugs, cars and lemonade to being diagnosed with bipolar disorder. Listen to the song above.